Last night’s dinner was not a full on theme night, but it got pretty close. 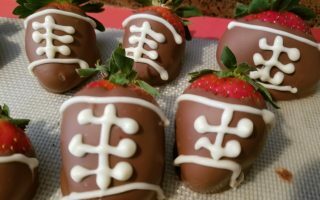 I love to play with my food, and the kids love it too. 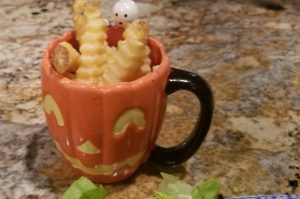 Since we are solidly in the Halloween spirit now, I wanted to watch “It’s The Great Pumpkin, Charlie Brown!” with the tinies and have a lightly themed dinner. I made this one pretty easy for you – just a little fancy dress for the burgers, and not a lot more. 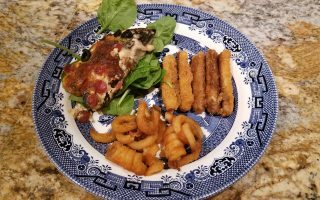 The menu for this meal was Great Pumpkin cheese burgers, baked beans “I got rocks!”, pumpkin stems (fries) and pumpkin patch greens (salad). 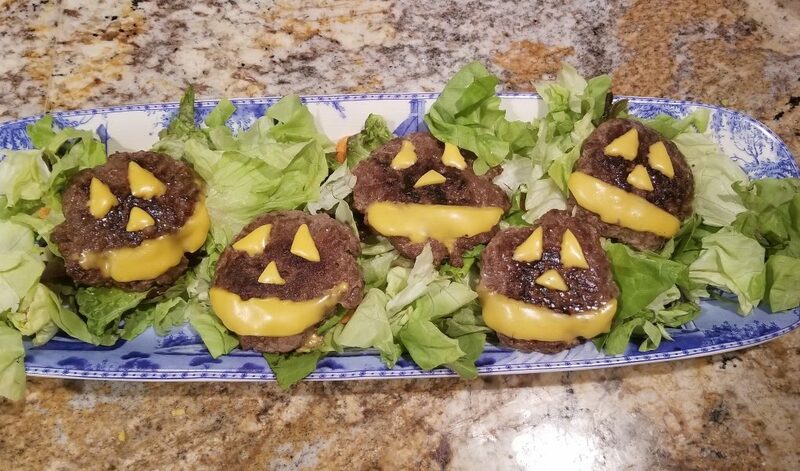 I served the burgers on a bed of salad so that they looked like they had come straight from the pumpkin patch. My 10 year old thought that they were too cute! My three year old just wanted more cheese. You win some, you lose some I guess. The burgers were super easy. I freezer cook at the beginning of each month. I usually put together hamburger, cooked, seasoned ground beef, taco beef and chicken, and a few other things that I know we are going to have at least once during the month when beef is on sale. I buy in bulk, spend some time one weekend in prep, and benefit from that couple of hours in the kitchen ALL month! 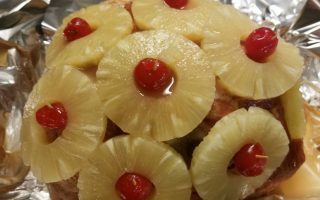 Check out my beef freezer cooking post and my chicken freezer cooking posts by following the links. The burgers were the same ones I patted out and seasoned in the beef freezer cooking post. We finally got ready for them, and they were all done, just had to thaw the night before and hang out until the grill was hot. The faces were made with shapes I cut from slices of American singles. They melt right onto the burger and the edges even out a bit. Don’t worry if your cuts are a little ragged, they will melt out. Processed cheese is a little hard to work with. The beans were canned (I love Bush’s Baked Beans and Bush’s Steakhouse Beans – no sponsorship, but they should, I buy enough of them! ), so super easy, and I bake the fries to cut down on fried foods in our life. That and I don’t love vats of boiling oil on a stove that Teeny might touch – call me silly. The salad was a green lettuce blend with cucumbers, carrots and tomatoes. To finish off the meal, and for a little weeknight fun as we dimmed the lights and enjoyed our show, I made hot chocolate with “Great Pumpkin” shaped marshmallows. This has been the first week where we have had consecutive days of Fall weather, so we are thrilled to be in sweaters, having hot chocolate, and generally feeling the spirit of Fall upon us. Happy theming and drop a link to your burgers, I want to see the cuteness! This looks so good!! Thank you for sharing these great ideas!! Thank you! We have had the best time playing with our food.